Discover the beautiful Adriatic with this superb 7-night luxury Split and Brac twin centre holiday. 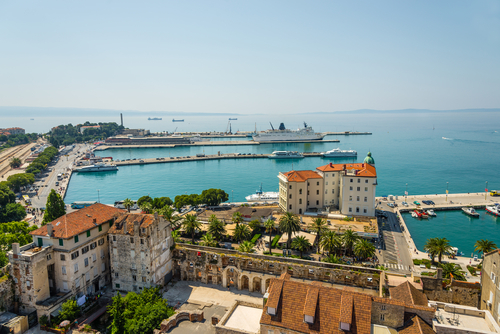 Explore the wonderfully historic city of Split with its UNESCO listed Diocletian’s Palace and stunning architecture before hopping over to the island of Brac. Brac offers sumptuous and world-renowned beaches and a myriad of activities for all. 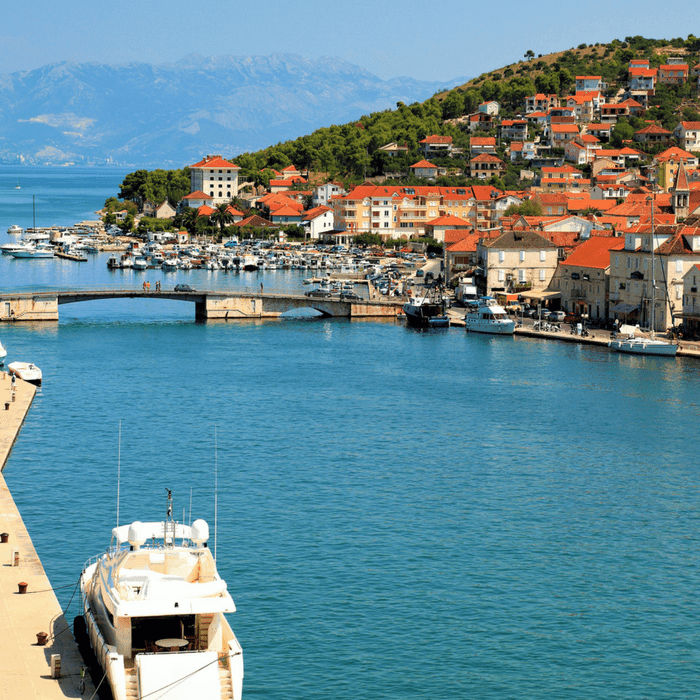 The town of Bol is an idyllic spot to relax and admire its beautiful harbour or visit Vidova Gora to get exquisite views over the other Adriatic islands. Includes return flights from the UK in low season months of May and October. 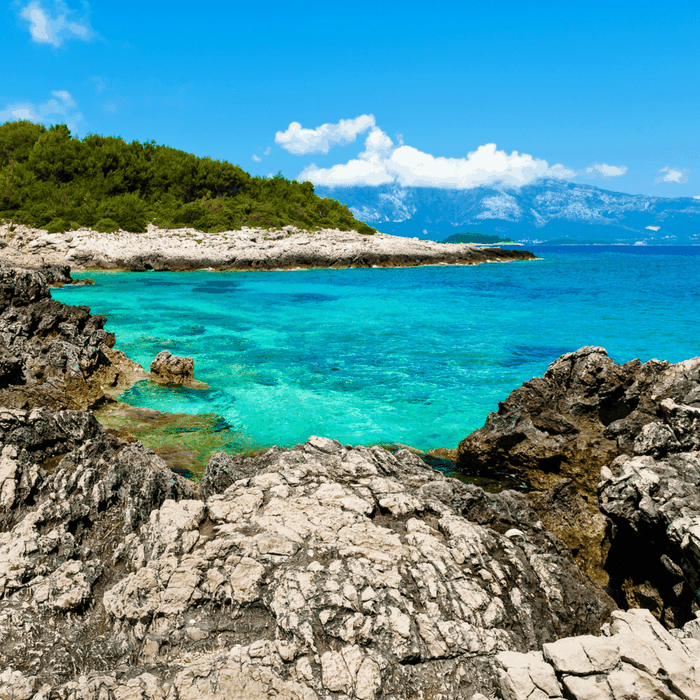 Discover the beautiful Adriatic with this superb 7-night luxury Split and Brac twin centre honeymoon trip. Explore the wonderfully historic city of Split with its UNESCO listed Diocletian’s Palace and stunning architecture before hopping over to the island of Brac. Brac offers sumptuous and world-renowned beaches and a myriad of activities for all. The town of Bol is an idyllic spot to relax and admire its beautiful harbour or visit Vidova Gora to get exquisite views over the other Adriatic islands. Welcome to Split! As the second-biggest city in Croatia, Split is the main harbour in Dalmatia region and a starting point for many holidaymakers. 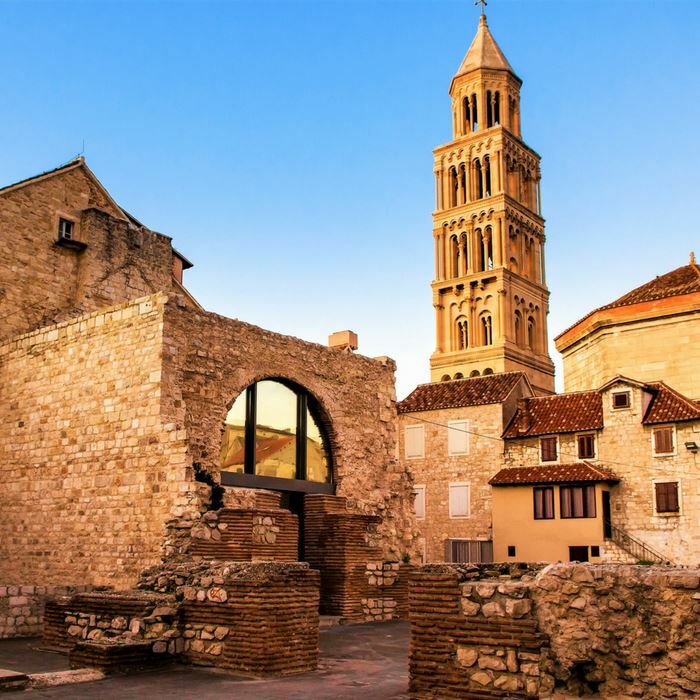 The Diocletian’s Palace makes the core of the Old Town and a symbol of modern-day Split, incorporating an eclectic combination of Roman temples, Gothic palaces and modern Mediterranean-style stone houses. We will organise a private tour of Diocletian’s Palace and Old Town so that you can learn about Split’s history in great detail. Don’t miss Riva, Split’s palm tree-lined promenade, panorama from Marjan hill or simply walk the cobbled streets of the Old Town, infused with history. To start your day, visit the Klis fortress, lodged in the mountain above Split. In the past, it served as a line of defence against Mongols and Ottoman empire. Later, continue towards Trogir. 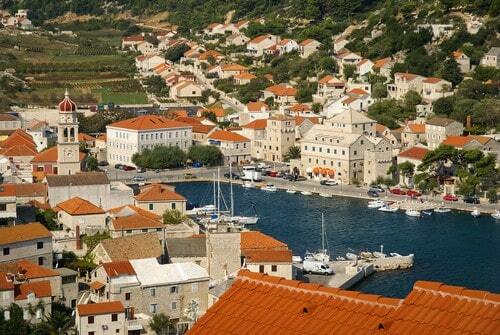 This Medieval island town is another UNESCO-listed site in Croatia. 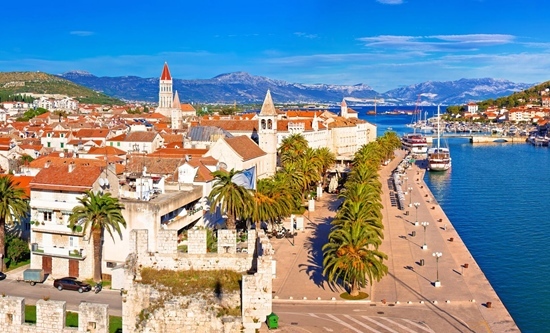 Walk the streets of Trogir admiring preserved Kamerlengo castle and tower and a series of dwellings and palaces from the Romanesque, Gothic, Renaissance and Baroque periods. Connected with Trogir via bridge is Čiovo island, and with a short walk or a taxi drive, you can spend part of your day enjoying beautiful beaches. 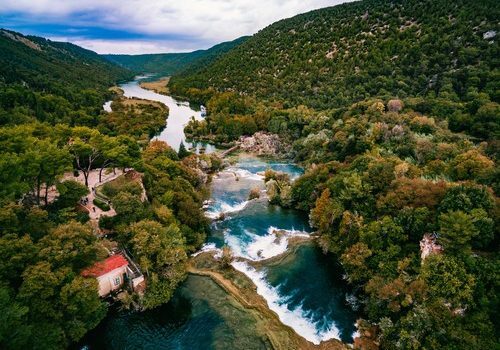 If you’d like to change scenery and to swap cityscapes for landscapes, head over to the Krka Waterfalls national park. Enjoy beautiful waterfalls and lakes and stroll along pathways winding through the lush flora. Don’t forget to bring your swimsuit as you’ll have an opportunity to have a swim in front of stunning Skradinski Buk waterfall. Afterwards, visit the city of Sibenik and admire its UNESCO-listed St James’s cathedral and fortresses. It’s possible to extend the visit so you can visit the local ethno village, with demonstrations in traditional food preparation, or visit birds of prey sanctuary. 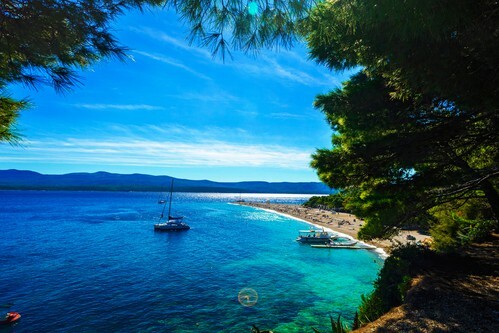 After breakfast, our driver will take you to Split harbour where you will board a ferry to Brac island. Check into the hotel and spend the rest of the day at your leisure. Explore the picturesque town, relax at the beach and enjoy local cuisine, surrounded by lush nature and beautiful sea views. Brac island is very bike-friendly, so if you wish to explore the inland villages, olive groves, vineyards and coastline further, cycling is one of the best ways to do so. 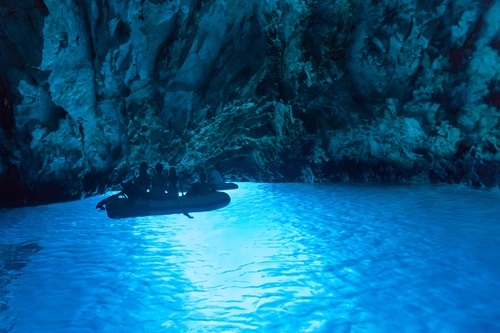 Today you’re be up for an adventure onboard a speedboat for a group tour of nearby islands and an unforgettable visit to the Blue Cave, a stunning natural phenomenon, wowing visitors with its ethereal blue glow. Spend the day cliff jumping, snorkelling, cave diving and discovering hidden coves and beaches, accompanied by an experienced guide. 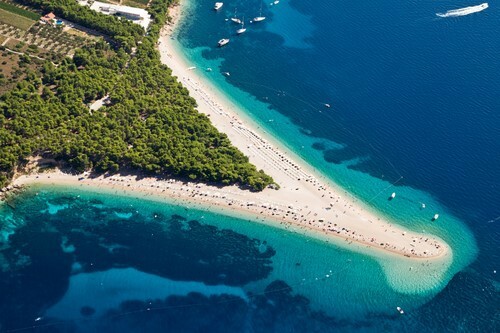 Go on a tour with a private driver, who will drive you up St Vid mountain for stunning panoramic views of the famous Zlatni Rat beach and island of Hvar. Afterwards, you will visit Blaca Hermitage, then Skrip, the oldest village on the island, containing the museum of island of Brac and Museum of Olive oil, where you can learn more about the production of ‘liquid gold’. You can stop for lunch or olive oil/wine tasting on the way. 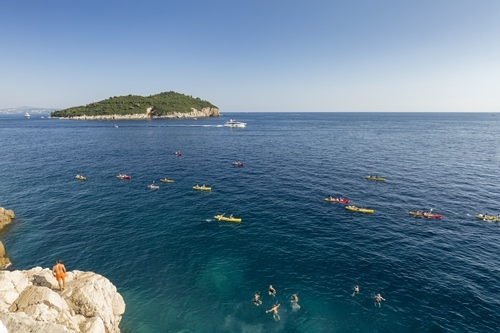 If you like to be active on your holiday, why don’t you go sea kayaking along the clear waters of the northern side of the island, or join a buggy safari, exploring unbeaten paths, zipping through the olive groves and quarries. These two activities offer unique perspective of Brac island and allow you to explore its natural beauty – and having fun whilst doing so! 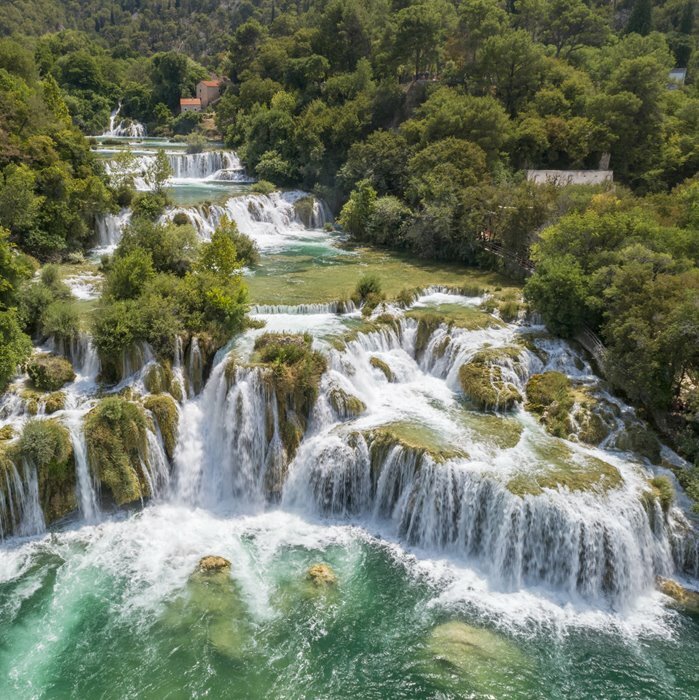 You will have a transfer to Split by ferry and then your driver will meet you for the drive to Split airport following a memorable Croatian honeymoon adventure.